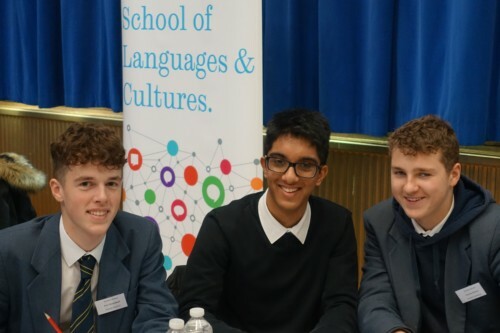 On Friday, twelve talented S5 linguists took part in a business and language challenge event organised by Business Language Champions (BLC) in conjunction with the Rail Alliance and hosted by Sheffield University. The rail industry employs 190,000 people in the UK and with its many partnerships on the continent offers many opportunities to use languages in a business context. The teams used their French and German language skills to complete a series of tasks related to the rail industry. The day also included a keynote speech by Lucy Prior MBE, International Trade Director at the Rail Alliance and a Japanese language taster session. In a tough field, despite not winning the overall team prize, two students were awarded individual prizes: Sam Boardwell for Language and Leadership and James Taylor for the quality of his spoken German.